This Spiced Cranberry Chutney is full of festive flavour. Serve it on your Christmas cheeseboard or give as a gift to foodie friends. My love of cheese knows no bounds. So when I came across a trashy “news” article saying that we should eat more cheese in the wintertime (for its high levels of vitamin D of course…) I jumped all over it. The best way of getting more cheese in your diet? Piling it on top of a cracker along with some home-made chutney. It’s not just me who eats a tonne of cheese at this time of year. At Christmas my family gets through an UNHOLY amount of Cheese; from soft to smelly, sheep’s cheese to goat’s cheese. In fact, cheese is a popular Christmas present in our house, as are chutneys and other preserves. When coming up with this particular chutney recipe, I wanted something that didn’t just go well with cheese, but something that well and truly said CHRISTMAS! So, my starting point was cranberries. For a truly festive flavour I had to combine tart cranberries with warming cinnamon, nutmeg and a touch of ginger. This, combined with the basic chutney mix (the fruit, vinegar and some onion) seemed like a good place to start, but I didn’t want to play it too safe. So, to give the chutney an extra kick, in the ingredients list you can also find pink peppercorns, red chilli a little garlic too. This works really well to give the chutney a bit of excitement without drowning out the mellow Christmas spices. 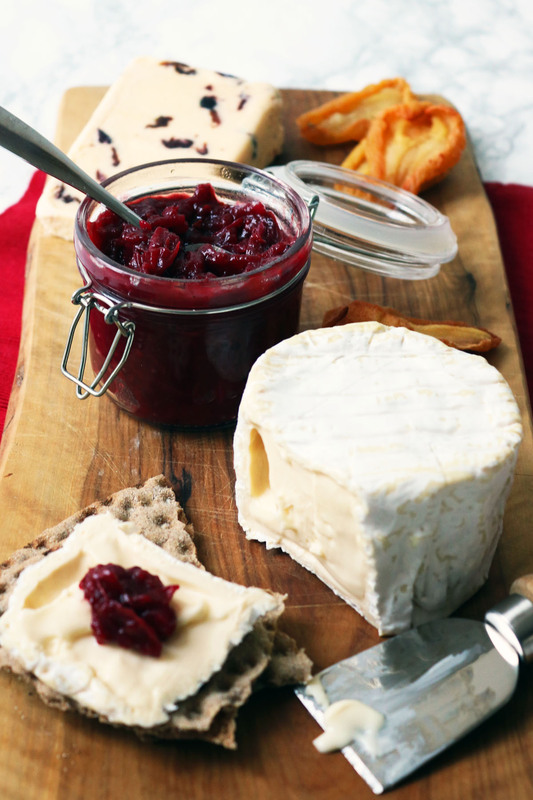 This festive cranberry chutney will work well with all whole range of cheeses. The recipe will fill two 250ml jars which means you can keep one for yourselves and give another as a gift! Or, like me, save it all for yourselves and pop it into an extra large jar! Fry off the onion and chilli in the vegetable oil. Avoid using any flavoured oil as this will taint the taste of the chutney. Once the onion has begun to soften add the cranberries and spices. Let the flavours develop and then add the vinegar and sugar. Bring this to a simmer and allow to bubble for 20-25mins. The chutney is ready when it sticks to the back of your spoon. Once reduced down spoon straight into your sterilised jar(s), place on the lids and allow to cool. When the seal has become airtight you will hear it “pop” as it gets sucked in.